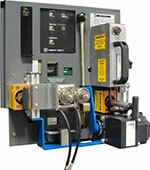 The CBS ArcSafe® RSA-12A provides remote CHARGE, CLOSE, and OPEN operation from up to 300 feet away from the equipment. The RSA-12A is lightweight, portable, and ideal for remote operation in hard-to-access areas. Its quick and simple setup requires absolutely no modifications to the user’s equipment, and it is compatible with all sizes and generations of type DS circuit breakers offered by various manufacturers.